Tashanta, Russia. 25th September 2014. 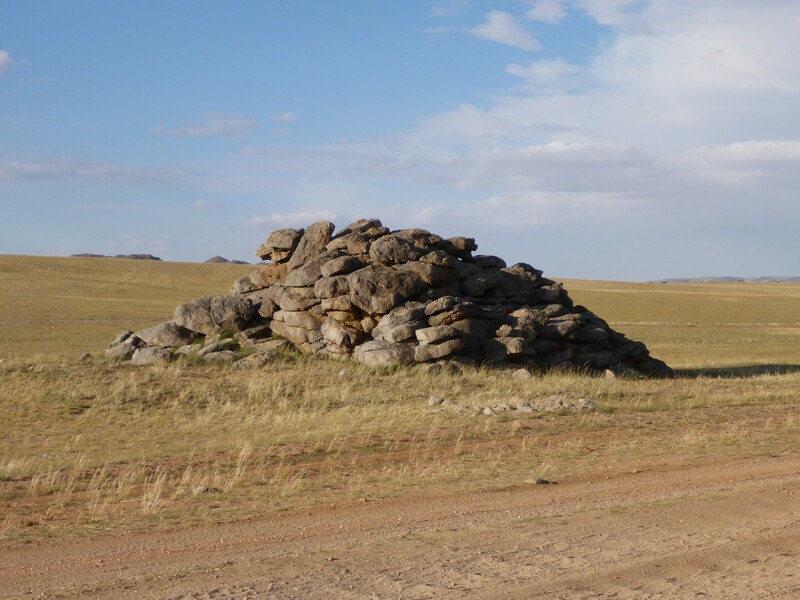 Mongolia has two claims to fame in the minds of most people. Firstly, it represents a place that is about as far away as it gets, as in ‘It might as well be in Outer Mongolia’. Secondly, the Mighty Mongol Hordes, who swept across Asia and into Eastern Europe, slaughtering or conquering everyone in their path. Putting perceptions aside for the moment, Mongolia is a remote country and is the second largest landlocked country, after Kazakhstan. It is also the worlds least populated – by humans at least. Thirty percent of the population is still nomadic and there is almost no arable land. 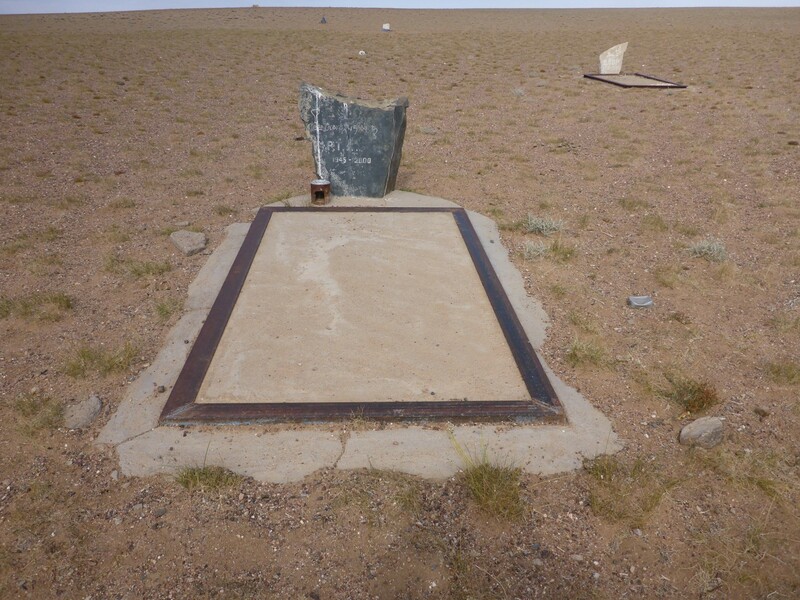 It is vast and empty, with a small population and yet in the 13th Century it produced a leader who became synonymous with a huge empire, Chingghis Khan. As well as being a brilliant general, he was also an effective diplomat, and it was this skill as much as any other that enabled him to rule such a large territory. In fact it was his Grandson who ruled over the largest contiguous empire known to the world, having conquered China and formed the Yuan Dynasty. From Ukraine to Korea and Siberia to Vietnam, over 100 million people lived within it. As with all things, time brings change and eventually the Yuan Dynasty collapsed and Mongolia went back to tribal rule. Inner and Outer Mongolia were absorbed in to the Chinese Qing Dynasty and Buddhism became the national religion. Internal problems in China enabled Outer Mongolia to declare independence in 1911 but it then came under Russian influence during the 1920’s and became a Soviet state in 1924. It finally regained independence in 1990. Under the Qing Dynasty Chinese were not allowed to settle in the country so it retained the Mongol way of life. Not so under Stalin, who destroyed most of the monasteries and killed over 30,000 monks. Mongolia has a large mining industry (21% of the economy), with nearly half the population involved in agriculture and herding. Despite its reputation for being vast, empty steppe, over 11% of the country is forested. One of its less attractive claims to fame is having the world’s coldest capital. Ulaanbataar has an average annual temperature of zero degrees. It is also one of the most polluted. But despite its recent modernisation as a country, it is still a destination of choice for the adventurous traveller and particularly for the Adventure Traveller. I was thrilled to have arrived there. 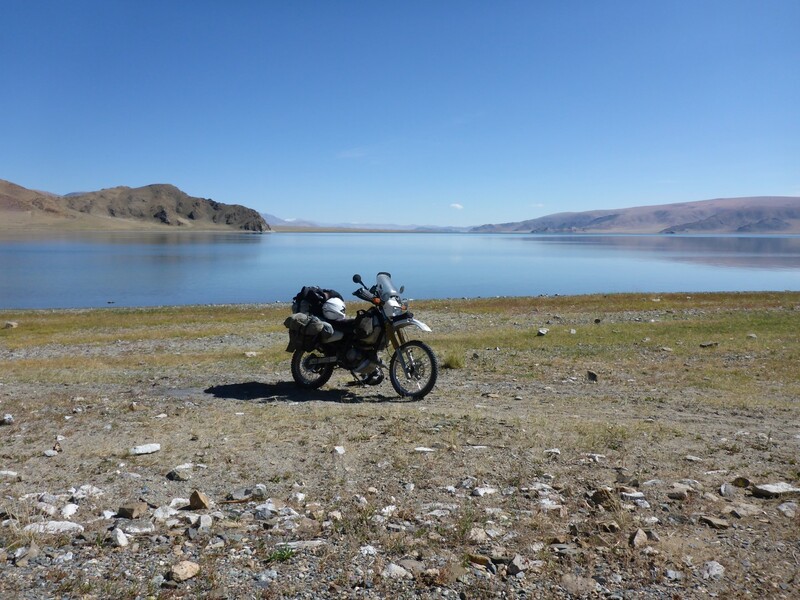 The accounts of previous motorcycle travellers still spoke of vast steppe, trackless wilderness, Ger living herding families and wild but beautiful countryside. I headed away from the border on a road that was quite rough but after about twenty kilometres it turned into smooth asphalt , no different to the one on which I’d arrived. Plenty of steppe but nothing trackless about the regular white line down the middle of the road. Apart from an unfinished section as I went up a hill, the road held good until the first town. Just before I entered it a guy standing next to a bike at the side of the road waved me down. I assumed he wanted help, broken down maybe, but he actually wanted to invite me to his house for chai. I had a feeling chai would become lunch and money would have been expected to change hands, so I declined. 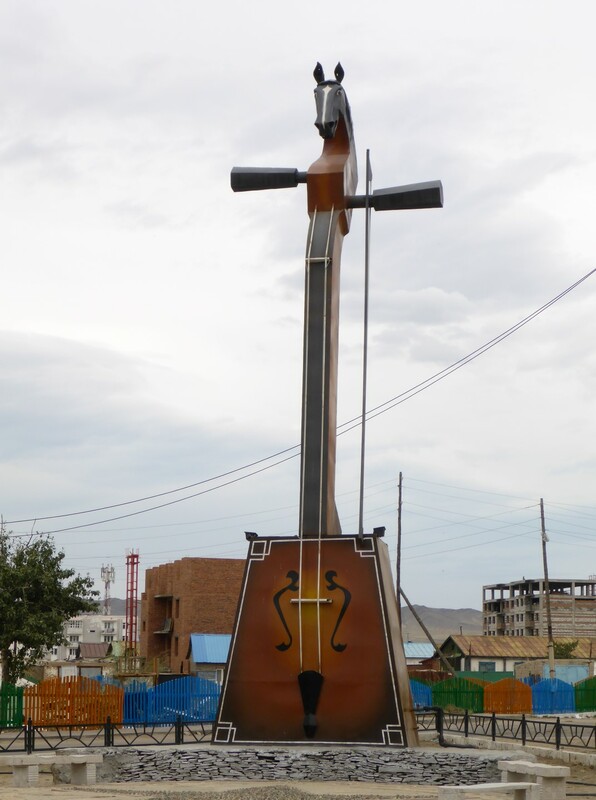 Olgiiy, the first Mongolian town I have seen, was quite large and had loads of petrol stations. There seemed to be two, or even three, on almost every junction. I filled up and was pleased to have someone do it for me. No messing about with pre-payment as in Russia, just sit back and watch it flow. Then pay, of course, about the same price as in Russia – 65p per litre. This town looked busy and interesting so I was looking forward to a chance to walk around one of them. As I left I had to stop at a barrier for a police check. Name, passport, where are you going etc. I wondered how common this would be and also what the point of it was, given that people could take dozens of different tracks across the steppe and avoid the checks completely if they chose to. 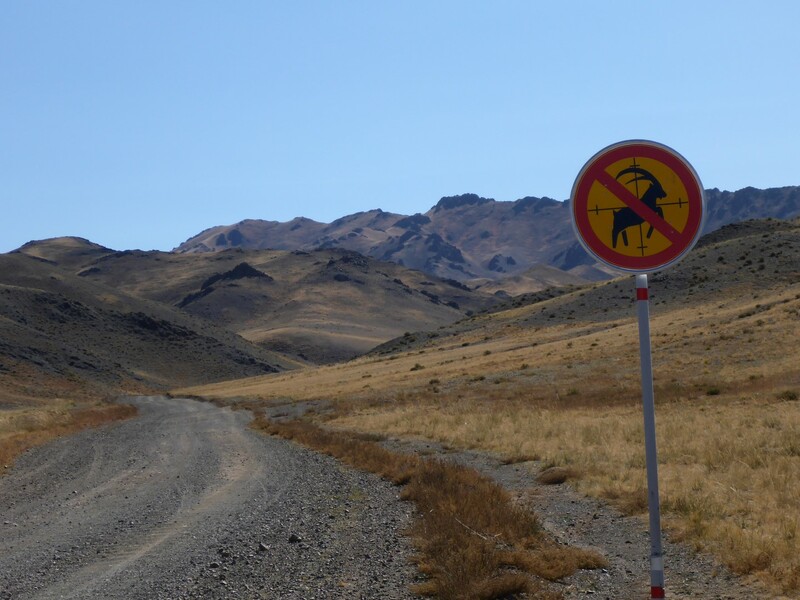 I was aiming for the next town down the line, Khovd, so I didn’t hang about in Olgiiy. I found a really nice place to stop for some lunch. A deep blue lake, which I could ride down to and sit beside. Sit on a rock and watch the herons across the way while I nibbled. A nice, calm, place which was clearly well liked judging by the piles of empty bottles I saw there. Shame. After about fifty kilometres the road changed from asphalt to hard packed stone although still up on a raised causeway. Eventually that ran out and I was onto a plain old dirt road. Sometimes loose stones, sometimes hard packed, sometimes sand. The terrain became more hilly and the track twisted up and down to flow around them. Some sections were very stony and tough to ride. Some places were boggy and I had to ford a couple of small rivers. I even had a severe ‘moment’ in some soft sand but managed to hang on and keep moving forward (mostly). I was starting to like this but was glad I’d fitted some decent off road rubber. 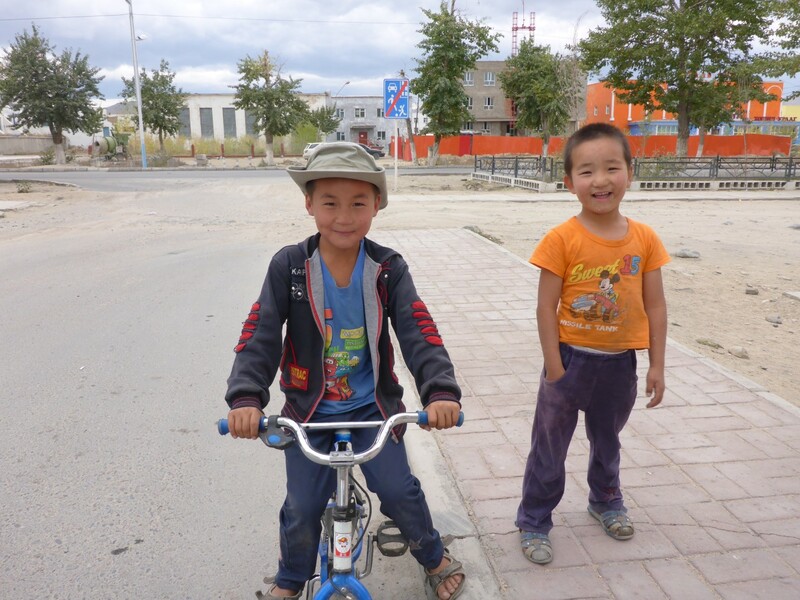 About twenty five kilometres outside Khovd I came across a young Mongolian with a broken down bike. There was no spark and his battery was flat. I linked his up to mine but still no go. He wanted me to help him push the bike about 500 metres across to some Gers, then give him a lift somewhere. I wouldn’t have minded the pushing but wasn’t keen on trying to carry a passenger on my crowded bike. Luckily a car came along just then. I flagged it down and my young friend seemed to know the driver. I happily left them to it. The only problem now was that it was nearly dark. I wasn’t about to chance such a rough track without the sun to help me so I rode off up the hill beside the road and found a place to pitch my tent. I had thought I was out of sight of the road but just as I was cooking my meal a guy rode up on his bike. I think he was just curious. As far as I know the land is public in Mongolia so he wouldn’t have been the owner. We chatted a bit, as best we could, and eventually he rode off.It was nice to be out in the tent in such a wide open space and the stars overhead looked bigger. I could certainly see more of them and the Milky Way looked magnificent. 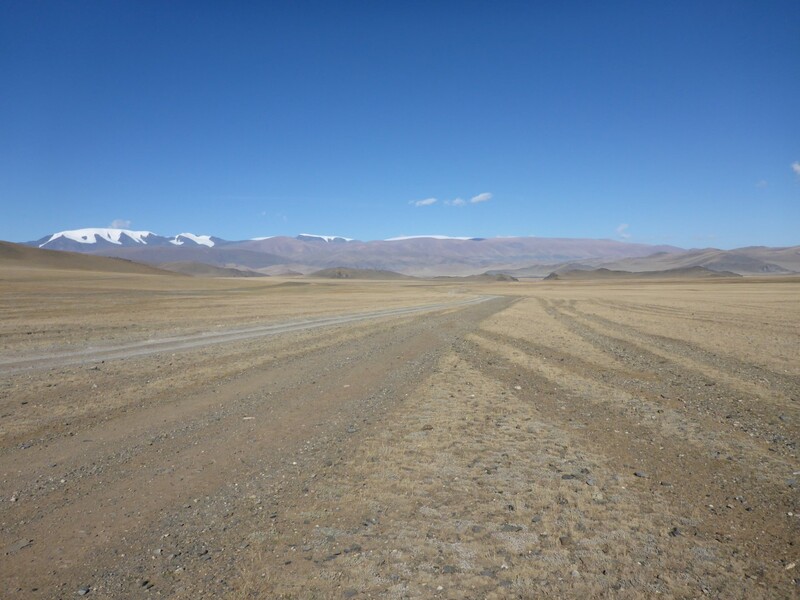 The endless steppe I’d come to Mongolia to enjoy. Once in Khovd the next morning I found a nice hotel, with wi-fi, and got a reasonable room for a couple of nights for a reasonable price. There were enough tourist sites in the area to make it worth a stopover. Communication in the hotel was in Russian, which was useful as my Mongolian language skills matched the terrain – very rough with the occasional breakdown. The Mongolian language is written using the Cyrillic alphabet so I could at least pronounce the words if not actually understand them. Listening to people speak, the words seemed to have lots of long vowels and soft consonants. I felt it would be a very hard language to learn. In the hotel I met a young Californian guy named Matt. He had been travelling for about five years and managed to carry on his work as a Software Engineer while he did so. He used a mobile phone and worked at odd times of the night to match his clients’ needs. He’s used various means of transport, most recently a bicycle, but was planning to take a bus up to Olgiiy to buy a horse and a packhorse. 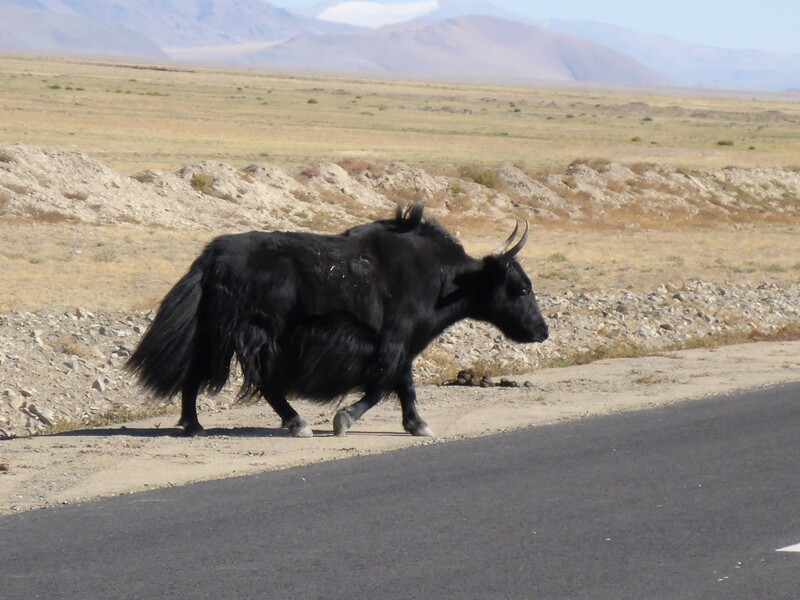 He was then going to ride back to Khovd with them and decide where to go from there. I agreed to meet him later for something to eat and then went for a walk around the town. Gers are still important even to the town based dweller. Plenty of people still live in Gers in the town and will often have quite a large fenced off area, with two or three Gers inside it along with a brick building too. The ubiquitous pick-up truck would be parked in the yard and sometimes a couple of horses. It seemed to be a mix of ancient and modern which clearly worked for them as it was very common. 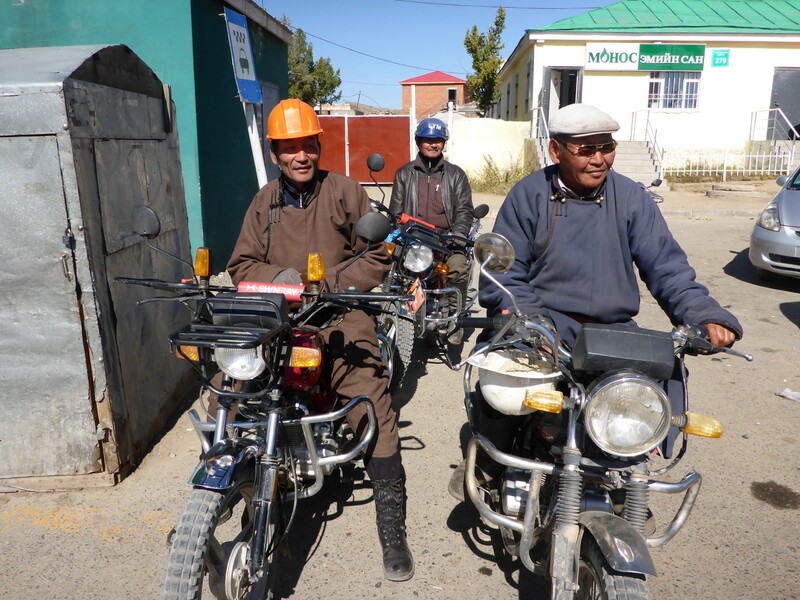 Mongolians make good use of the cheap Chinese built motorcycles too. Usually 150 or 175cc, they have a rack on the front and rear, crash bars and usually some LED lights as a bit of bling. When I was out walking I saw them at busy places in the town and it became clear that they were often used as cheap taxis. 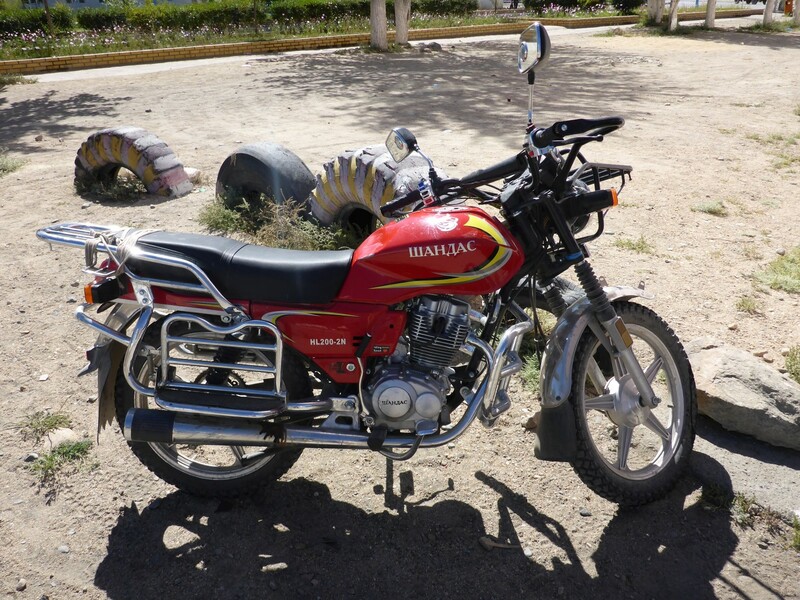 They’d be parked in groups and someone would hop on the back of one of them and the rider would carefully set off to an outlying area of the town. Handy and tough. Chinese bikes were everywhere. During my first walk around a Mongolian town I was interested to see the way that businesses of the same type would often be grouped together. One street I walked down seemed to be little other than tyre suppliers (a very essential service on this terrain) but with the occasional car spares shop. Another one was all electrical and electronics suppliers. A third seemed to contain all the town’s banks. This seemed very strange to me but it makes sense really. At least you know where to go for a particular service and could easily compare prices. 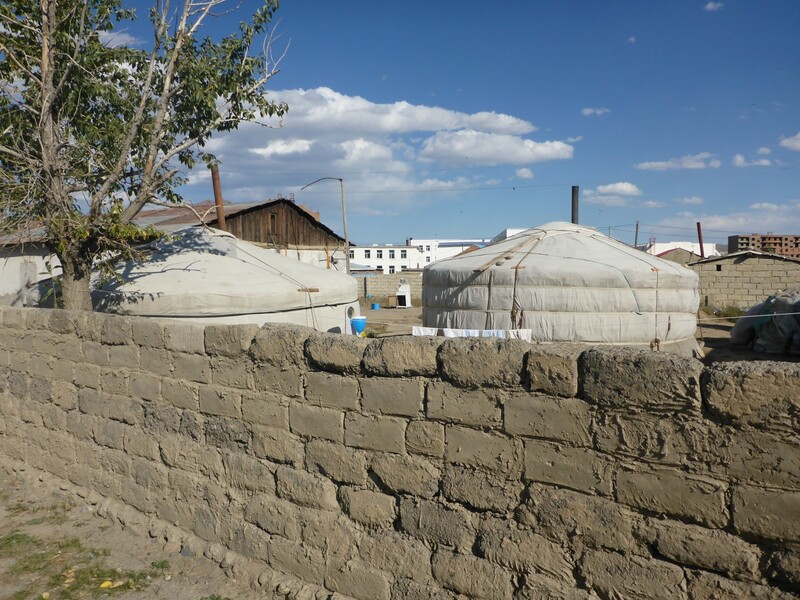 There was also an area where the street was lined with containers, something I was to discover was a common sight in Mongolian towns. Out of these could be bought large bags of dry goods such as rice, pasta, milk powder etc. The vendor would be sitting on a chair just outside, or just inside if it was wet, and would help the buyer load their purchases onto the back of their pick-up. Typical market place leisure. 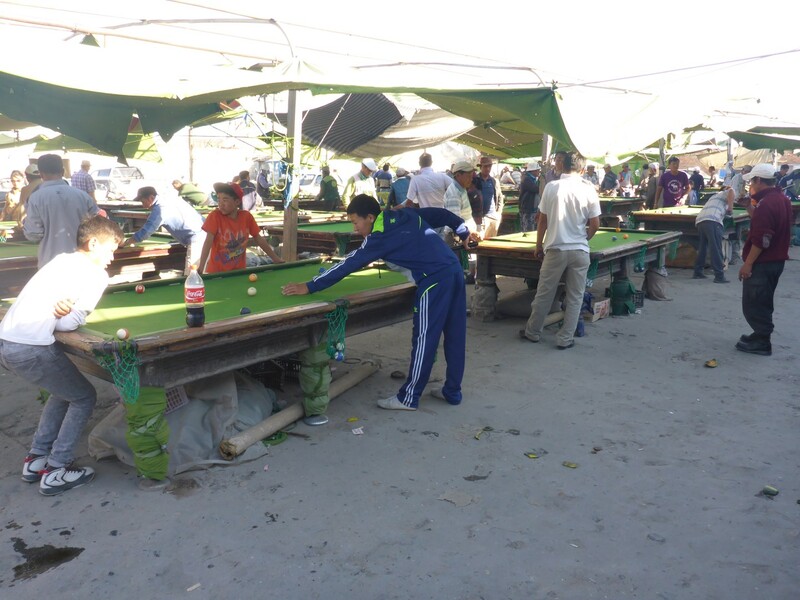 Mongolians love a game of pool. As with Olgiiy, almost every junction seemed to have two or three petrol stations around it, usually with fuel at the same price. Even though it was Sunday, there seemed to be plenty of commercial activity around and about. The junctions often had traffic lights, which seemed a bit incongrious in a town surrounded by vast nothingness. I was pleasantly surprised to be greeted by passers-by, usually teenagers or children. They’d say ‘Hello’ or ‘Hi’ as I walked past, giving me a nice smile at the same time. I discovered that they all start to learn English from the age of seven or eight and clearly like to show it off when they can. ‘It’s surprising who you meet when you’re out for a ride’, is probably what these kids thought when I asked them to pose for me. He seemed to like my hat though. The town itself has plenty of building work going on, with apartment blocks going up and new pavements and asphalt surfaces being laid. There was one aspect of the town that no amount of improvement work was ever going to change; the fact that whenever I looked down a street that reached the edge of town, not far beyond it was a mountain rising up out of the grassland, usually with a network of grassy tracks running out to it. I was pleased to be reminded that neither politics nor money was ever going to change that. I met up with Matt later and we went in search of something to eat. 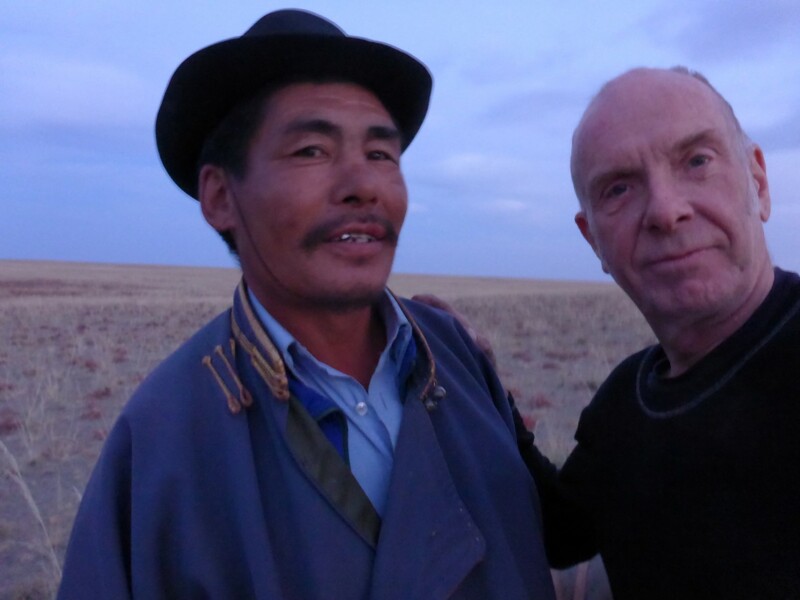 It was a round trip because we ended up back in the hotel restaurant where we ate sheep, the staple diet of Mongolia. Matt had heard a rumour of some chicken but the place was closed. He is an interesting guy, not only in terms of his experience but also in his world view. He believes that taxpayers should have the right to vote directly on what their money is spent on and if they make bad decisions they’d have to live with the consequences. He believes the technology is good enough to do it. I expressed doubts a) that the system would work and b) that the technology really is good enough. He said that a similar system already exists in Switzerland – it doesn’t, at least not in the way he thinks. The Swiss do vote more often and on a wide range of issues but they do it on paper ballots, not electronically. He strongly believes that the current system is coercion tantamount to theft, given how broken the political system is. In America I can see where he’s coming from, given the way politicians are bought by lobbyists and donors but I said that we’re not that bad in the UK yet. I also explained that we have a greater number of political parties so there is greater pluralism. But even so, his theory is an interesting one and would represent true democracy if it could ever be made to work. Matt has found his ‘bus’ out of town. Political discourse over and done with, we chatted about his plans for pony trekking and my plans for circulating Mongolia on my own steed. We were both looking forward to seeing this very different country, meeting its people and, literally, seeing how the land lay. One comment of Matt’s made me think. Like many Americans, he’s not very interested in history, geography is his thing. He said Asians aren’t into history much either, it’s mainly a European interest. That struck a chord and it’s worth considering the reasons behind that. Something to think about during those long road miles. 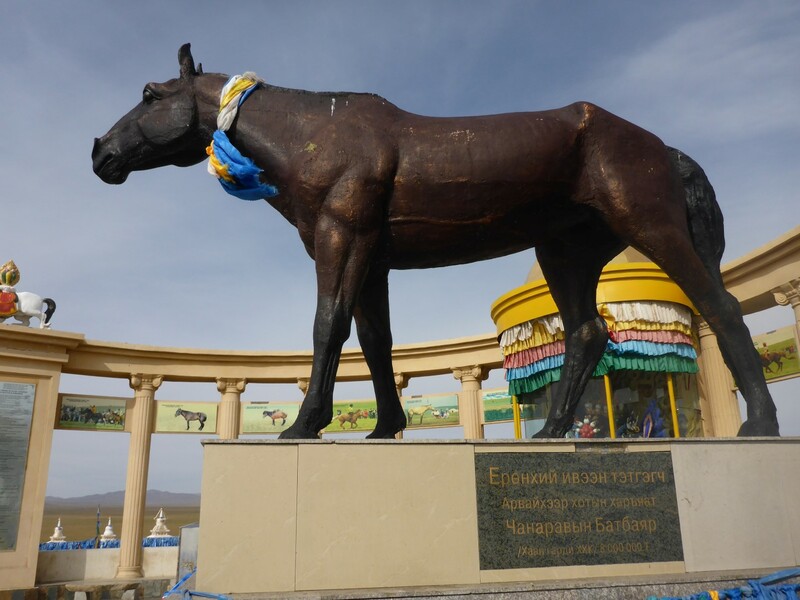 It’s not unusual to see statues in Mongolian towns. This is one of the stranger ones. Next day Matt was due to leave Khovd to pursue his search for horses. The idea had quite and American flavour to it. The pioneer kitting out for the trek west. He had discovered that a minibus was due to leave from the market square at 14.30. I was impressed that he’d discovered this given the language barrier. I was even more impressed when I learnt that he’d done it by showing people drawings of a bus and a clock. Clever lad. I walked up there with him and once he’d confirmed the arrangements we went for a walk around the market. We called in to a shop for some supplies and I immediately noticed a strong smell, one which I had also noticed on some Mongolians. We pretty soon realised it was from the large blocks of fat that were on sale, presumably to be used for cooking. It was very strong and I wasn’t surprised that it seemed to be so difficult to wash out of their clothes. We chatted some more while we waited for his bus to leave. Just before he went Matt asked me that crucial question that seems to trouble so many people when they talk about England. ‘Is it true’ he said, ‘that the English drink tea every afternoon at five o’clock?’ ‘Good luck Matt’ I said as I shook him warmly by the throat! I stayed another day in Khovd, my excuse being ‘research’ but in reality I had a bit of a sniffle and didn’t feel like moving on. I tried to ask the people at the hotel about cave drawings, petroglyphs and so on. But the language barrier was too great. Trying to find GPS coordinates on line didn’t work either. So eventually I went out for a chicken meal, something I did know the location of. The waitress gave me an odd look when I asked for soup as well as the main course and when it arrived I could see why. The bowl was so big that it would have made a meal in itself but I somehow managed to get through it all. My departure next morning wasn’t especially early but I was in no rush. The road out of town went past a check point, although not a police one. I was asked for TG1,000 and offered a ticket of some kind. I went inside the hut with my map to check directions and what with all the pantomime involved, we were all having quite a laugh. In the end it was straight on, and I enjoyed a smooth asphalt road for a while. While the riding was easy I was thinking about my first impressions of this very different country. Generally they were good ones. The landscape is bare and wild but the mountains are quite gentle so far. It’s quite green, with plenty of domestic herds – camels, cattle and sheep. Herdsmen ride horses or the small, Chinese motorcycles. The pick up truck reigns supreme although there are some large 4×4’s around too. While some of them are a bit old, none of them are as battered as those I saw in the poorer parts of Kazakhstan or Kyrgyzstan. The hotel was nice enough although the plumbing was a touch 3rd world. Nothing worse than other places I’d been though. 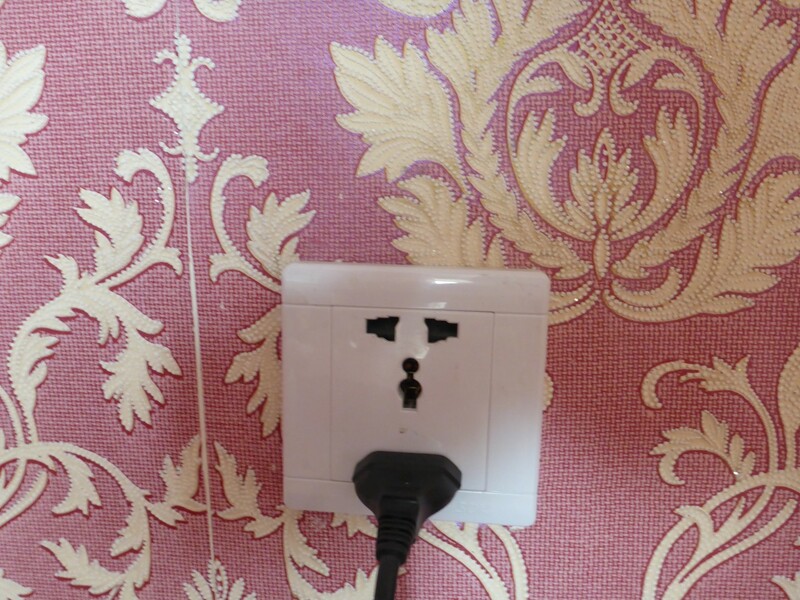 This socket could take at least three types of plug, including a British 13 amp. The towns are thriving places and are being extended and improved. During my walks I saw schools, colleges and theatres. They often have a central square, usually with a statue or two. Not surprisingly the most popular subject is Chinghis Khan, the second most popular is the horse. The school kids look smart and would often say ‘Hello’ or ‘Hi’ as I walked past. Keen to show off their English which they start to learn at about seven or eight years old. The adults seemed pretty much indifferent to Matt and I but would return a greeting. Very little English is spoken. Horses but where’s the box? One thing I was surprised to see, at least the first time, was a pick up truck with about five horses on the bed, standing alongside each other in a head/tail/head type of pattern. They didn’t seem in the least concerned by this but I just had to stop and take a photo. As time went on I saw more of them and when I reached a small town I could see why. There seemed to be some kind of event going on as there was a stage and sound equipment being set up. I reckoned that the two were connected but I had no idea how. Possibly some kind of market or fair. I camped that night, sheltering among some low mounds about 500 metres from the road. What an experience that was! At 10pm all was calm but by 4am I was in the middle of a howling gale. My attempt at finding shelter was a massive fail! I got up when it became light and managed to win the wind/tent/packing away battle. I’d had plenty of time to lie awake planning a strategy for it, which worked I’m pleased to say. One of the problems with off road tracks is that they often develop a ‘washboard’ surface. This has the same effect as might riding across a corrugated iron roof and is almost impossible to deal with. The only way is to ride extremely slowly or fast enough to ‘float’ across the corrugations. They really hammer the suspension of the bike as it tries to keep up with the rapid changes in surface – and fails. The reason they develop is the way that the suspension of the heavier vehicles hammers into the soft road surface and builds up small ridges. It is a bone jarring, teeth loosening experience and this is one of the reasons why there’s always several alternative tracks to choose from. If you want to get across it, you ford it. It was while I was taking one of the alternative tracks that I realised it had drifted away from the main ones and was heading off in the wrong direction. I’d already had an ‘off’ in some soft sand but even so, I decided to head across some open terrain to join back up with the main track. It was fairly hard sand interspersed with small mounds that had plants growing in them. Inevitably I got tangled up in one and fell over again. This time the bike came down on my leg. I was lying half face down with my leg trapped beneath the pannier and my other leg still across the bike. I managed to release the straps that held my large bag on the back and got that out of the way but the bike was still too heavy to lift up sufficiently to pull my leg out. ‘OK’ I thought, ‘let’s summarise’. 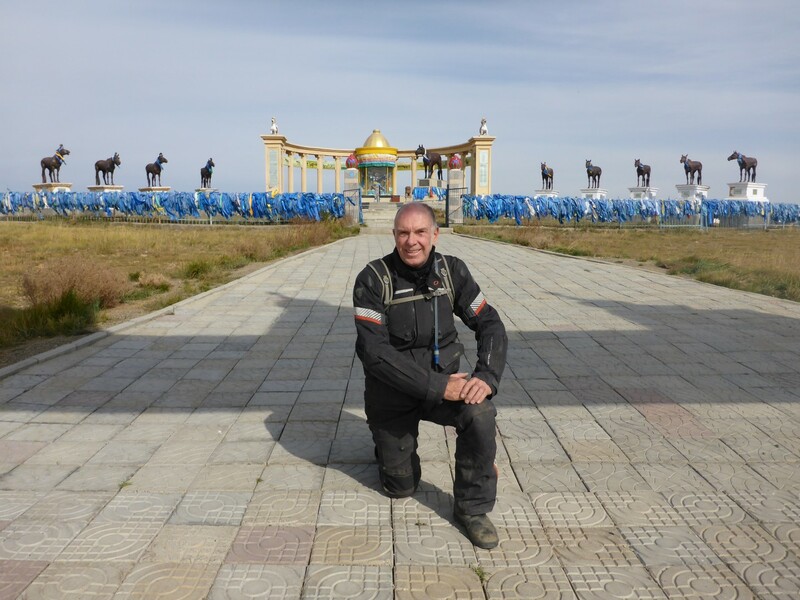 Here I am in the wilds of Mongolia, not even on a track and too far from the ones I was riding between to be seen from either of them. The bike was lying on my leg and I couldn’t pick it up. On the bright side I wasn’t injured, I had food and water with me and I was very glad I had a soft pannier lying on my leg rather than hard metal one. In the end escape was easy. After more heaving and straining from my position half sitting and half laying across the bike I decided to lift my free leg across the bike and once they were both on the same side I was able to just slide out from underneath it. Talk about making a drama out of a crisis! I picked the bike up, made and drank a coffee and carried on. Eventually I got to the town of Altai and settled on a hotel after some scouting around. None of them had internet and although there was an internet café it was shut. I’m guessing that was because of the power cut that was in action when I arrived and for the same reason none of the ATM’s worked either. ATM’s are infernally useful and intensely annoying at the same time. They’ve completely replaced travellers’ cheques and money exchange places but they can be very frustrating too. Many of them only give out relatively small amounts of cash so visits sometimes need to be frequent and that can cost dearly if your bank charges for for their use, as mine does. So a certain amount of forward planning is required if I’m going to eat and sleep. Outside of Europe cash is king in most places and credit cards merely bring forth a puzzled look followed by arms crossed in the shape of an X, the universal sign of ‘Sorry sunshine, you’re out of luck’. One thing I’ve discovered about Mongolia is that they clearly have far more sand than duck down, because that’s what the hotels seem to fill their pillows with. Maybe they’re pandering to the visiting nomad, who’s used to sleeping with his head on a rock, but I know I didn’t like it much. Next morning brought forth a visit to a greasy spoon café, where the ladies of the family merrily took the mickey out of my request for a knife to eat my breakfast with. Come on ladies, you can’t cut gristly sheep with a spoon. It also brought forth a working ATM which would release a sensible amount of money – TG80,000, which is around £27. It doesn’t seem like much but it goes a fair way in terms of food although not in hotel rooms, last nights being TG45,000. So I hit it three times to make sure I had enough. 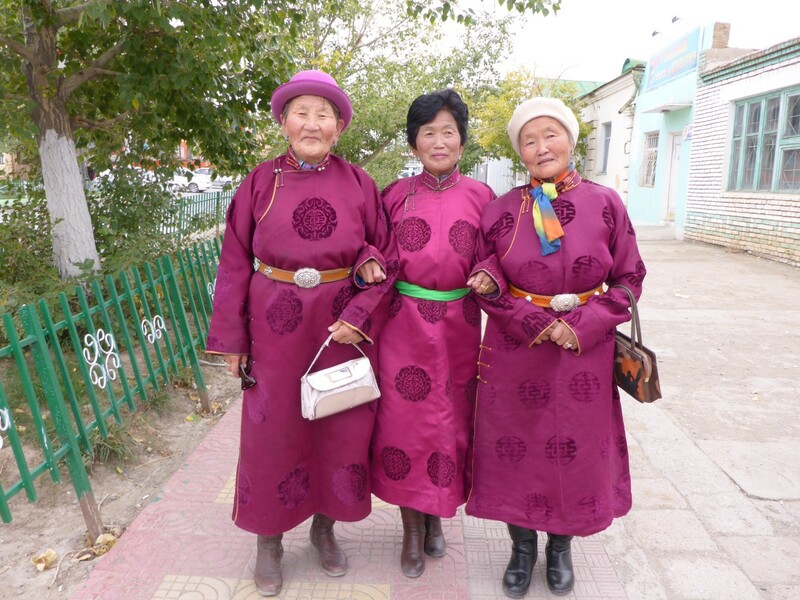 Further on along the street I met three elderly ladies all dressed up in their traditional Mongolian outer garment, the Deel. These are a type of warp around coat and can come in summer or winter weights and be made of wool, silk, cotton or brocade. They can even be fur or leather. These ladies were wearing brocade Deels and were clearly on their way to an event of some kind. They were more than happy to pose for a photo for me. My mood was lifting in the chilly morning sunshine. Three lovely ladies in their Deels. The rally is designed to be an adventure for the participants, and not a traditional rally/race. The organisers (“The Adventurists”) are careful to point out that racing on highways is illegal, and that no recognition is given to the first finisher. There are other differences from mainstream rallies, particularly the fact that no support team is provided and no other arrangements are made such as for accommodation. Indeed, the diminutive vehicles are deliberately inappropriate for the task, in the adventurous spirit of the rally. On average, between 250 and 300 teams enter the rally annually. Most teams have 2-4 people. 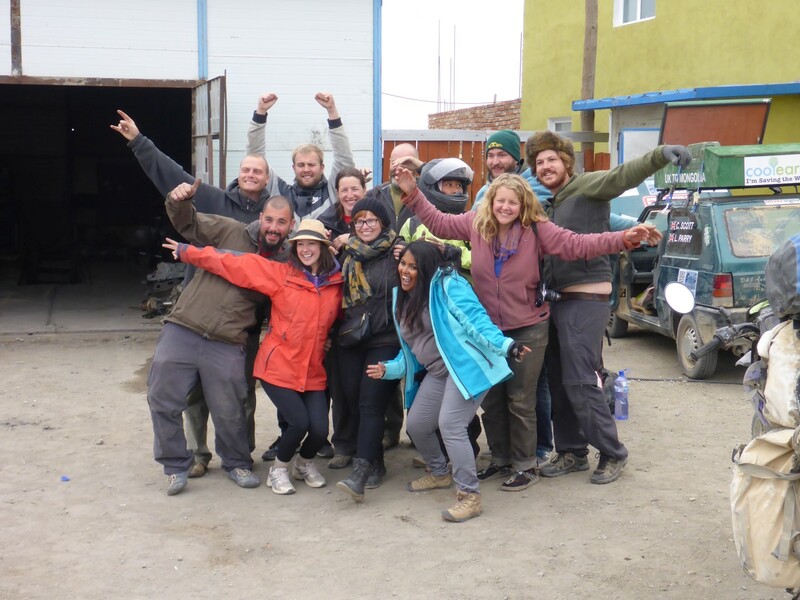 For the first time ever, a team from Malta took part in the 2014 Mongol Rally. The people I met were waiting while a mechanic reattached the rear subframe of their Fiat Panda back to its chassis. We chatted a while and listening to some of their tales of their journey across Iran and Central Asia, I was starting to feel like a wimp. It was nice to have a chat in English with Charles, Lyle, Helen and Kerri and I wished them well on their journey. Some of the rally crews. All my business done, I got ready and headed off. On the way out of town I passed a garage which had a big ‘Mongol Rally’ banner across the front of it. Gathered outside were a group of about ten rallyists, including those I’d met earlier. Of course, I stopped for another chat. The Fiat had been repaired and they were waiting while the mechanic did a ‘cut and shut’ welding job on some front coil springs which would then replace the broken ones on one of the other cars. A nice bit of ‘make do and mend’ going on there. Amongst the group was a woman from Singapore named Li. She’d decided to undertake the rally on a Honda XBR125, a 125cc road bike. She’d had a tough time riding on the sand – I could really relate to that – and had struggled with the cold too. Much respect to her. Although the rally rules limits two wheelers to 125cc I think I would at least have chosen a trail bike! Li’s Honda XBR125. More suited to the city commute than rally action. Once the asphalt came to an end the road deteriorated into a twisty, rocky, steep, stony, sandy, washboarded mess. I couldn’t believe this was the main road between Altai and the capital. I couldn’t begin to imagine how trucks got along it. Some of the rallyists had left before me and I came across them after a while, stopped at a junction unsure of which way to go. I was happy to stop and enjoy a rest and share my biscuits while we discussed the options but eventually a local came along and we asked him. Problem solved. They roared off again, clearly enjoying their competence on the rocky, sandy trail, I proceeded with a good degree of ‘falling off will often hurt’ caution. The road continued to be a challenge, very stony, and progress was slow. There were often huge piles of boulders at the tops of the hills, left there by glaciers I imagine, and worn into interesting shapes by the weather. It was when I stopped to photograph one of them that one of those weird events occurred that makes me wonder what it is that drives the universe. I put the camera away, put the bike into gear and the clutch cable snapped. Bugger! No problem as I had a spare taped into place alongside the original, ready to deal with exactly this event, as any sensible bike rider does. All I needed was the 12mm spanner from my tool tube which ………. was no longer on the front of the bike where it ought to be. ‘Bugger!’ was not a powerful enough word to respond to this situation so I dug deep and sorted out a few appropriate ones. You’ll have to use your imagination. This was serious. No tools meant being unable to deal with punctures or any other kind of breakdown. Not good in the middle of nowhere. I managed to change the clutch cable without the spanner as the adjuster nuts weren’t too tight and I could undo them with the pliers on my penknife. I was thinking back while I was doing it and remembered hearing and feeling a particularly hard knock from a rock thrown up by the front wheel. It was only a few kilometres back and I felt certain that was where the tool tube had been damaged and fallen off. Clutch cable now replaced, I went back and within a kilometre I saw the tube lying on the ground, not even as far back as I expected. I reckon the rock had broken one bracket and it had taken a little while for the weight of the tube and movement of the bike to do the rest. The tools had even stayed secure inside the broken tool tube. Was I relieved? You betcha! I camped nearby and spent the cold evening wondering what would have happened if I hadn’t stopped to take that photo. The cable would still have broken but probably several kilometres further on. It is likely I wouldn’t have had such a clear memory of where the damage had been done and may not have ridden back so far, or had the daylight in which to do it, with disastrous results. It was just coincidence and good luck, nothing else, but there’s nothing wrong with being grateful to whomever, in this case that large rock. So thanks for being there for me rock. You Rock! A frosty start saw me continuing along the stony track. The riding was getting very technical and I was enjoying it a lot. It reminded me of some of the trails I’d ridden up in the Yorkshire Dales. For a while I found myself riding along the path of an ancient glacier. There was an area of completely bare, grey, stony dust with no plants of any kind. Up to 100 metres wide in places, running between low hills. It looked more moonscape than landscape and it clearly carried a lot of water at times judging by the water run-offs. The track ran along this for about two kilometres and had some steep, tough climbs to deal with. 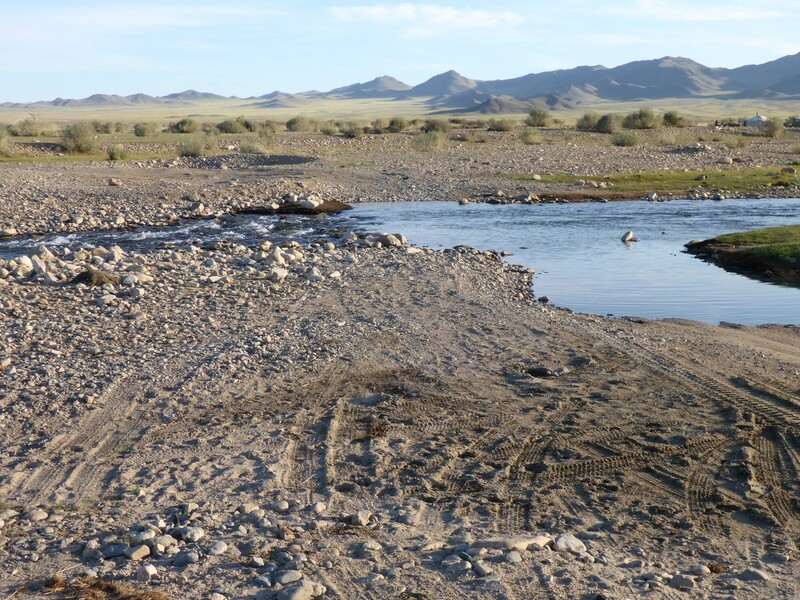 Mongolia has over two hundred and fifty sunny days per annum and I was enjoying another one of them. The time of year meant that the wind, when I was exposed to it, was quite chilly but working my way over the terrain kept me warm enough. Suffice to say I was really enjoying the riding. Wide, dry and very stony. I stopped for fuel in one of the towns I came to then went looking for a café. I saw a huge supermarket and eventually found a café within the complex. I recognised the word for Goulash on the menu and it was really nice and fresh, with, unusually, no gristle in the meat. I was just finishing up when one of the rally guys came in. They had stopped for supplies at the supermarket and had seen the bike. We chatted for a while before they roared off towards the capital, and that was the last I saw of them. ‘Rally’ cars. Just as unsuitable as the Honda XBR. I was heading for Arvayheer, a sizeable looking town where I planned to rest for a couple of days before heading off southwards into wilder country. It ought to be reachable before dark, depending on the road. Even so, I made sure I had plenty of supplies in case I had to camp again. As it was the road out of town was asphalt and stayed that way all the way there. It was getting colder and I was riding along dreaming of a cheap hotel with a hot bath and wi-fi. And all my dreams came true. At the second hotel I tried as soon as I walked in the lobby I saw the sign announcing wi-fi, the room was only TG20,000 (about £7) and was nice and big with ensuite bathroom. I booked in for two nights and began to relax. There was no hot water until 8pm but the bathroom had condoms in it!! Reflecting on the day had me thinking that although I was very much enjoying the sometimes tough riding I was amazed at the condition of the roads. They must be pretty much impassable in winter, especially the water crossings. That river bed route I came along must be full of water for months. But maybe the dry climate means that it doesn’t snow very much here. I hope not, for their sake. Taxi motorcycles. I love the crash helmets! Arvayheer is quite a busy town and is getting bigger. It’s another place with plenty of building and infrastructure improvements taking place. On my walk around I counted seven hotels of various standards. 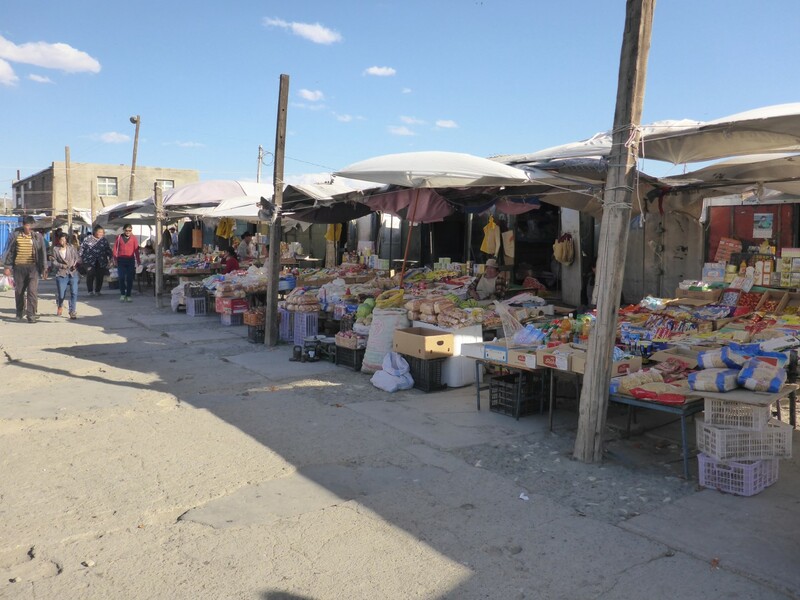 There is a busy market place, with a good variety of shops and some small shopping malls – really just large shops with small shops and stalls inside. 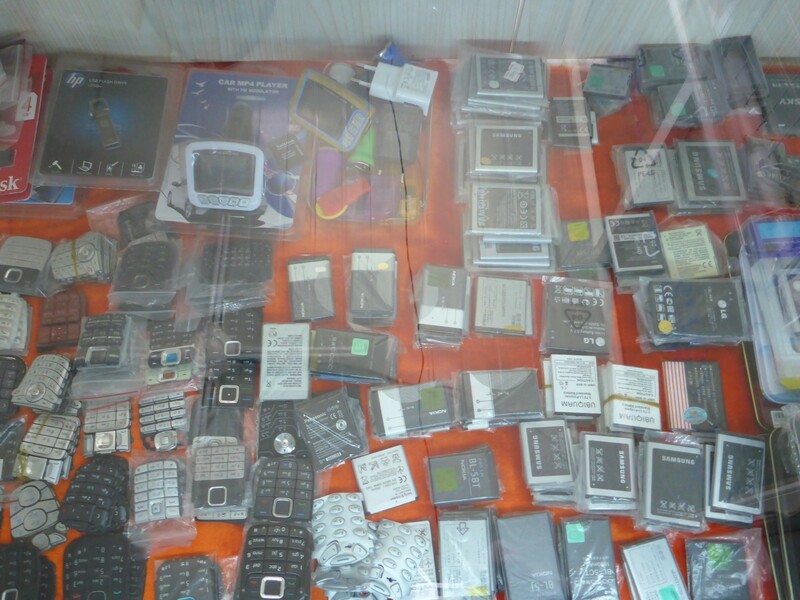 I was pleased to see that the mobile phone stalls also had plenty of spare parts for sale too. No throwing away of still usable parts. A very good thing to my mind and I imagine it helps to keep less well off Mongolians connected. Everybody seemed to have a mobile phone and they have become almost indispensable in developing countries. Repair rather than dispose. Mobile phone parts. Many of the goods on sale came from China, which was no surprise given its proximity and their shared history. Close to 30% of Mongolia’s trade is with their large neighbour to the south. I had noticed that most of the goods on sale in the small shops and supermarkets were fairly inconsequential. What I mean by this is that there were lots of sweets, biscuits, soft drinks, some household dry goods, some toiletries but very little by way of basic foodstuffs. There would be small packets of pasta, rice, sugar etc, but that was all. This had seemed strange to me at first but once I’d walked around the market places of a couple of towns it became clear that bulk buying of these items was the way it was done. Most market places had a section with old shipping containers from which would be sold 25kg sacks of rice, flour and all those things that the small shops didn’t sell. The markets would also have butchers’ shops too. There would be some vegetables for sale, often sold from buckets or off the tops of tables and they would mostly be root vegetables. 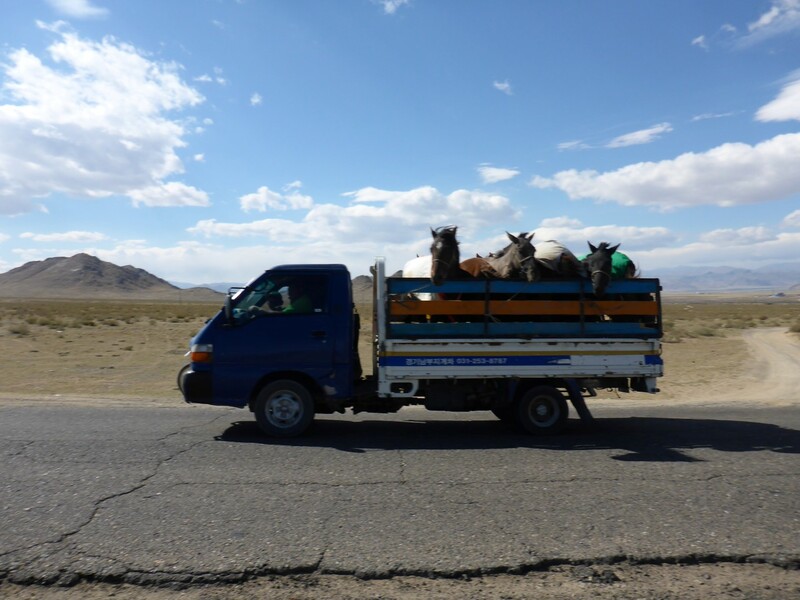 I did see cucumbers and tomatoes as well as apples and other fruit, but experience had shown me that the Mongolian diet wasn’t very varied and mostly seemed to centre around sheep. It’s likely that during the summer a greater variety would be available and it was often easy to get a salad in a restaurant, based around tomatoes, cucumber and onion. The whole situation does make me wonder about the health of the Mongolian diet and its effect of life expectancy. One of several graves out in the wilderness. On one of my off-track forays across country I’d come to a burial area, containing several graves. Reading the birth/death dates on the headstones suggested that life expectancy isn’t great but in a country as harsh as Mongolia there are likely to be many things other than diet that would affect the situation. They showed ages of 60-70 maximum, usually less. 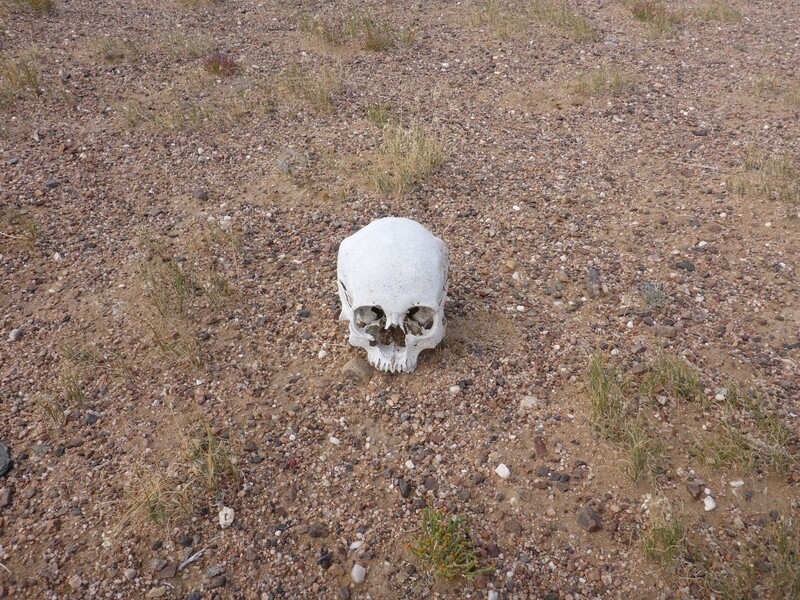 Sadly it seems that the loose ground had allowed animals to get to the corpses as I counted seven human skulls scattered about as well as other bones too. It’s a harsh life in a harsh land and it seems that death doesn’t always bring the peace it ought to either. I counted seven skulls lying around, plus various other bones. I left Arvayheer having managed to finally get rid of the sore throat that had bugged me for the last few days. On the way in to the town I had passed some kind of shrine so I diverted back to take a look at it. I had assumed it was Buddhist but when I went to look at it I wasn’t too sure. I later learned that it was a memorial site dedicated to Morin Tolgoe or Horse’s Head. Arvagarkheer was the fastest horse in an important race of over 1,000 horses sometime in the late 18th century and the town is named after him. The memorial is also a Buddhist shrine and has 108 animal related Stupas, which surround a statue of the horse. All of this underlines the importance of the horse in the culture of Mongolia. The horse the town is named after. 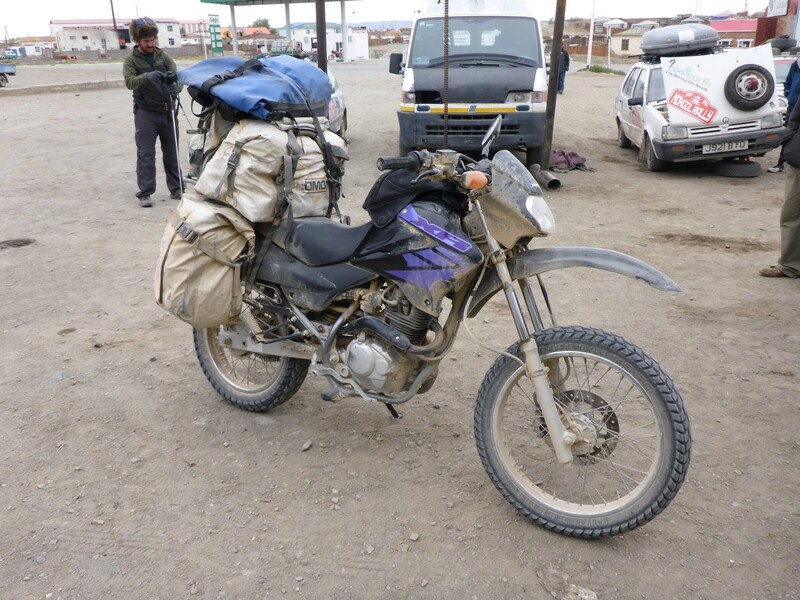 I had plans to ride across country to the southern town of Dalandgadzad from where I would venture out into the wilds of the Gobi desert. I planned to follow some roads which were marked in yellow on the map but in dust on the ground. I felt well rested and was up for the challenge, the first one of which was to find the right track! Some of the other roads out of town had signposts and as the one I wanted was a through route I was hoping it would have one too. Fat chance! I took a track that seemed to head where my GPS compass said I needed to go but it soon wandered off course. I stopped at a Ger and asked its occupant which way to go. He directed me back the way I had come then indicated that I should loop around the side of the hill. I had great fun crossing a fast flowing river that was in two parts, presenting me with a nice challenge. I never did find the track I’d planned to take but every time I came to a divergence I just took the track that seemed to head where I needed to go. Sometimes they were obviously well used, mostly they weren’t. Often they’d just go to a herder’s Ger camp so I’d have to turn back. Eventually, after another track petered out just past a camp I decided that I could be zig zagging around all day so I just carried on over and around the hills, following my compass rather than a track. I knew that if I kept going straight I would eventually meet one that would lead me to my destination. Mongolia is like that. And I was right. Seven or eight kilometres later I joined a small track, which then joined a larger one and eventually I arrived at the town I’d been heading for. That interlude was great fun. The riding wasn’t tough but I really enjoyed the feeling of not knowing where I was or whether my judgement was correct. I stopped for fuel and got a photo of a local who looked like a bit of a ‘character’ with his very decorative Deel, his cowboy hat and his goatee beard that he had grown off centre. But I couldn’t find a café, much to my disappointment. I had been told there was one in the town but it eluded me. I was cheered up by the ‘Hello’s’ and ‘How are you’s’ that some of the local children said to me as I walked past, keen to practice their English. I just love the individuality of this guy, especially that Goatee. So I carried on and after a while I saw a good camping spot, not completely out of sight of the road but far enough away. Even so, I had just got the tent up and was starting to cook my meal when a local rode up on his bike and sat down for a chat. I think he may have been suggesting I came to stay with him but I declined as I didn’t want the hassle of packing up my tent and gear. He pulled out a strange looking pipe which I thought at first was some kind of socket spanner. The stem looked to be a steel tube and the bowl looked like a socket. We enjoyed a couple of puffs on it and I offered him my tea to drink. He tried it but clearly didn’t like it. But he did ask me if I had anything to drink. He was chatting away about this and that, with me grinning at him like a fool because I didn’t have a clue what he was talking about. After a while he got up to go and I took a few photos before he left. That was an enjoyable little interlude even if we couldn’t actually understand one another. I finally made it to Dalandgadzad, my target town. I’d really enjoyed the ride down and especially some of the challenging terrain I’d had to tackle. My ability to ride in soft sand was improving – as much out of necessity as anything. I was feeling good about everything and was more than ready to venture off to explore some of the local sights. There is a technique to riding in soft sand that requires a very counter-intuitive approach. The front wheel tends to get grabbed by the sand and then starts wandering off course. The instinctive thing is to slow down and try to control it. The effect of slowing down transfers the weight of the bike onto the front wheel, which has no grip, so over you go. The technique requires you to stand up on the footpegs, hang your bum back over the rear of the bike and opening the throttle. Although the front wheel will still flap around, because there’s less weight on it the bike will keep going forward, more or less where you want it to, driven by the grip from the rear wheel. It’s very unnerving at first but it’s either that or paddle very slowly through the sand, still with the risk of bike and rider lying down together in a tangled mess. 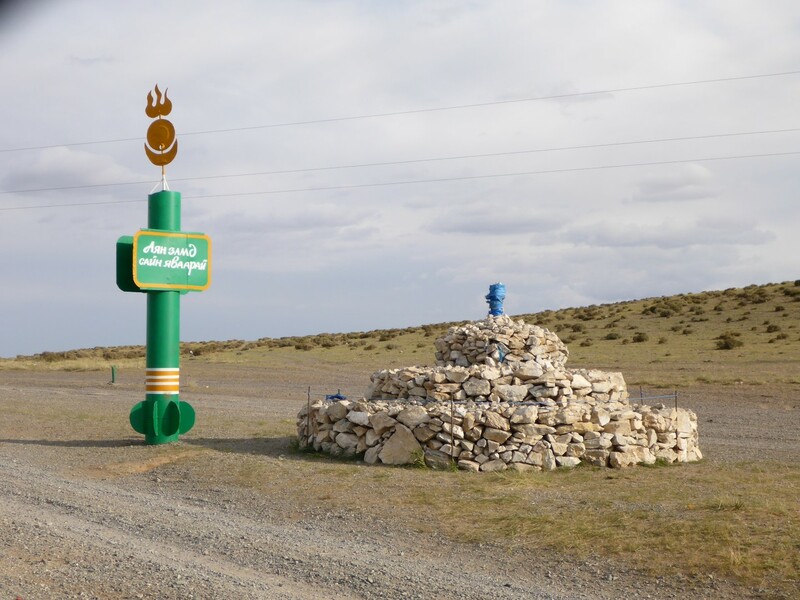 I stayed in Dalandgadzad four nights, spent in three different hotels. It may seem strange to some of you, but even though I’m out in the wilds I still feel the need to be able to get online whenever I can. It frustrates me when I know there’s wi-fi available but I can’t get access to it. It goes without saying that if I’m in my tent in the desert it doesn’t matter but conversely if it’s there I want it! So when I arrived in town and found a reasonable hotel I was miffed that they didn’t have wi-fi but cheered up when the woman there offered me a dongle to use instead. Good enough, or so I thought until I found it wouldn’t work. I went to find the woman to let her know. She was in the snooker room, just clearing up after a game some guys had been playing. She was carefully polishing the balls before putting them back in the box. Very impressive. When I explained my predicament one of the snooker players said ‘No problem, we’ll go out to the airport’. Eh, what? So three of us bundled into a BMW and a young guy ‘drove’ us out there. He had clearly never driven a manual car before as he kept trying to pull away in 4th gear and, just for good measure, used the windscreen wipers as indicators. Fortunately it wasn’t far away and when we got there I discovered that one of the snooker players was the airport manager and the one who spoke English had come down from Ulaanbataar to train the airport fire fighters. Mongolia has a network of small airports, all centrally organised from the capital, the only place where international flights land. They use fifty two seater aircraft and there are one or two flights per day out to the local ones. I was offered the use of the manager’s secretary’s laptop and when the dongle worked OK in it the manager insisted I take it back to the hotel with me and borrow it for the night. What generosity! Back in his office the vodka bottle came out. They insisted I had some because I was ‘their guest’. So I managed to get through a glass and I have to say it was quite nice! I quite enjoyed the buzz it gave me. We all chatted about various things, mostly in English but sometimes using a bit of Russian, before we eventually went back to the hotel. I was to return the laptop and dongle the next morning. That was a great interlude and I really enjoyed the contact with Mongolians, something that had mostly been missing since I entered the country. So on to hotel number two, where internet was available, if patchy. I spent the day planning a little trip I had in mind. I wanted to go out into the Gobi desert and see the really big dunes, Hongorin Els, which are one of the local tourist attractions. I’d also worked out a cross country route that would loop me around northwards across some open terrain, eventually taking me back to Arvayheer. I reckoned three days riding and two nights in the tent would give me a nice taste of wilderness before heading me back towards the next sightseeing area I wanted to explore. This hotel proved to be a bit of a disaster as well. The room had three beds, all with sandbags for pillows. There were about eight electrical sockets, only one of which worked. The wi-fi was very poor too but I could have lived with that if it wasn’t for the constant noise. There had been a celebration taking place on the night I arrived and I was woken up early the next morning by what I thought were some noisy teenagers outside my room. It turned out to be noisy adults who’d been partying all night in a room along the corridor. Becuase the corridors were lined with ceramic tiles the noise echoed along them to my room too. And just to cap it all, the internet wasn’t working anymore! Time to get out of there. When I’d booked in I’d asked if they took visa, and got an affirmative answer. When I tried to pay for the room with it I was directed to the ATM that stood in the lobby. Silly me, I should have guessed. I gave the woman some notes and waited while she scurried around looking for change. ‘Change always comes by itself’, I almost told her but eventually she got it organised and I left for hotel number three, glad to be out of there. 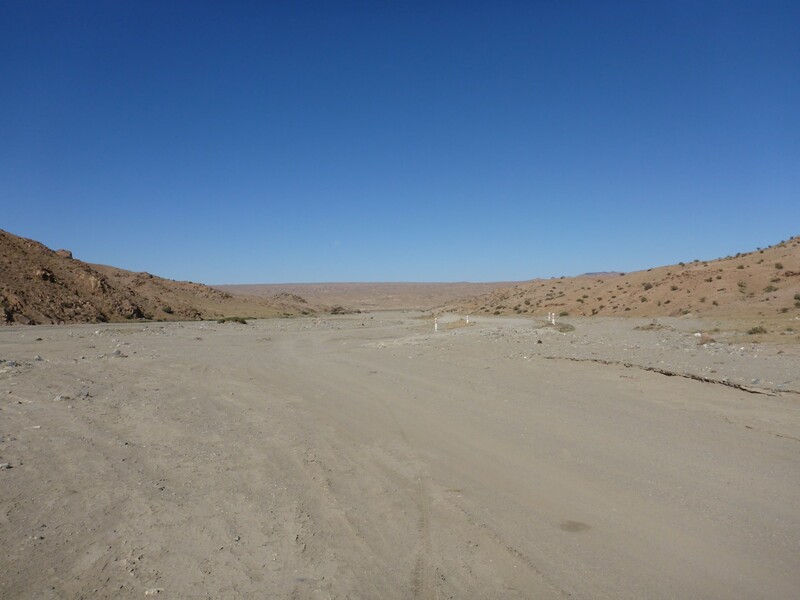 Once I was booked in to a nice room at the new hotel I set off on a day trip to Vulture Gorge, one of my three target sites to visit while in and around the Gobi Desert. Tomorrow I was planning to take a ride out to look for the Flaming Cliffs, an area of sandstone cliffs which turned red in the sunset. Apparently it’s still possible to find dinosaur fossils in the area. Finding the road to the gorge wasn’t as hard as I expected. I had GPS coordinates to head for so I took a nice asphalted road out of town which went roughly in the right direction. There was a signpost along the road but it made no sense to me, being more like a local map than anything else. But I could see that the road curved around to go where I needed it to go so that was good enough for me. The asphalt lasted about 25kms before road works took over and I was diverted on to a track along side it. Pretty soon I saw another track going off to my left in the direction I needed so I followed it. Sure enough, after a couple of kilometres the track came down to a car park and some kind of visitor complex. It was clearly the entrance to the National Park within which lay Vulture Gorge. The track had wandered across some steep hills, with deep valleys in between, whose form made them look as if huge mounds of green, grassy land had been dropped onto the earth from a great height and just left there. They were quite unlike anything I’d come across so far. Perhaps I should mention here that this gorge did not actually contain any vultures. It used to, many centuries ago, hence the name. These days its claim to fame relates to the fact that there’s a part of the gorge that never sees sunlight and it retains an area of frozen snow all year round. In fact, it doesn’t even do that any more as it has usually melted by September, the result of general warming up. So here I was, going to visit this place in September, just when the ice probably wouldn’t be there. No shooting. OK by me! And leave the goats alone! The track from the car park was surfaced with graded chippings and twisted and wound its way through some low hills. It had some very strange signs along it. 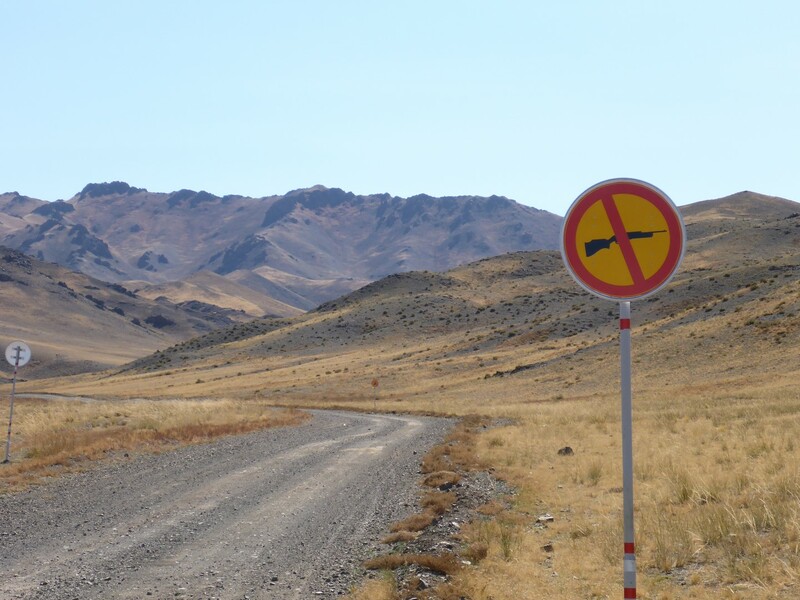 No rifles; No shooting deer (it may have been goats); no blowing of horns; no felling of trees (what trees, Mongolia doesn’t have any). There were plenty of long coated cattle up on the rocks above me and signs warning of mountain goats, although I didn’t see any. Eventually I came to a car park, which was as far as I was allowed to ride. I declined the offer of a horse ride, left my crash helmet and jacket with the bike and set off for a walk on a nice, sunny afternoon. There were some signs around, explaining what flora and fauna might be seen, and people selling trinkets. There were hills all around, not especially high but some were quite steep. They had some interesting looking plants up on them too, something not seen very much in Mongolia’s barren wilderness. As I progressed, following a small stream, the hillsides became cliffs and the valley narrowed as the stream got faster. 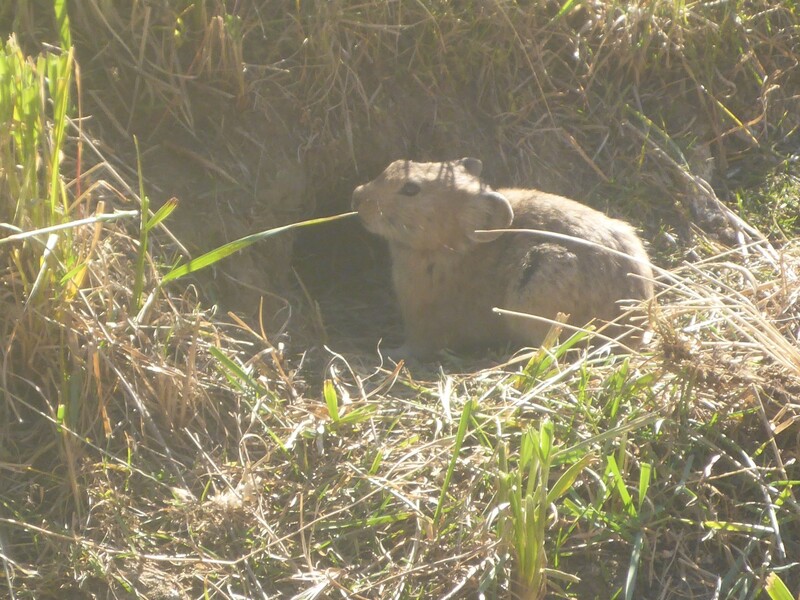 There were little animals running around all over the place, diving into their holes as soon as I approached. I have to confess I’m not sure what they were but they were clearly busy little creatures judging by the way they had worn paths into the grass. Hundreds of these little furry things running around. The valley narrowed down, the stream developed some deep pools and eventually I found myself in a place where the sun doesn’t shine. It was very odd. There was, as expected, no ice or snow but I was happy to potter about a bit looking at the minerals in some of the rocks, many of which resembled coal. I had seen a couple of guys as I walked down who both appeared to camp out here. They spend their time carving things from wood, probably to sell to visitors. I also saw a couple of Ovoos, with some prayer flags on them. I added a stone to each as I walked past. The sheltered length of valley had a strange feel to it. No bird song and an air of coolness and timelessness. I imagine it must be quite a spiritual place to some people. Ovoos like this can be found everywhere. After a few hundred metres I came back out into the sunshine at which point I turned back. The path carried on and I expect there was a very nice walk to be had, up among the hills, but not for people wearing heavy motorcycle boots and riding gear. The sun was now quite warm and I was glad to get back to the car park and start the ride back to town. On the way back along the access road I saw about ten 4×4’s coming towards me so it seems the Valley of Vultures is quite popular, with people if not with vultures. Back at the hotel I went into the restaurant to enquire about food for later. There was an American brother and sister in there and their guide, a Mongolian woman called Zaya. We all got chatting and I asked her if there was anything on the menu (only written in Mongolian) that wasn’t sheep! We all had a laugh about it and she pointed out a couple of dishes that included chicken. She also gave her phone number to the waitress with instructions that she should call her if I had any translation problems. When I went down there later on Zaya was there again, this time with a European couple who’d been out touring round the the national park to see all the sights that I was trying to get to. They invited me to join them, which I did, having just finished my chicken dinner. 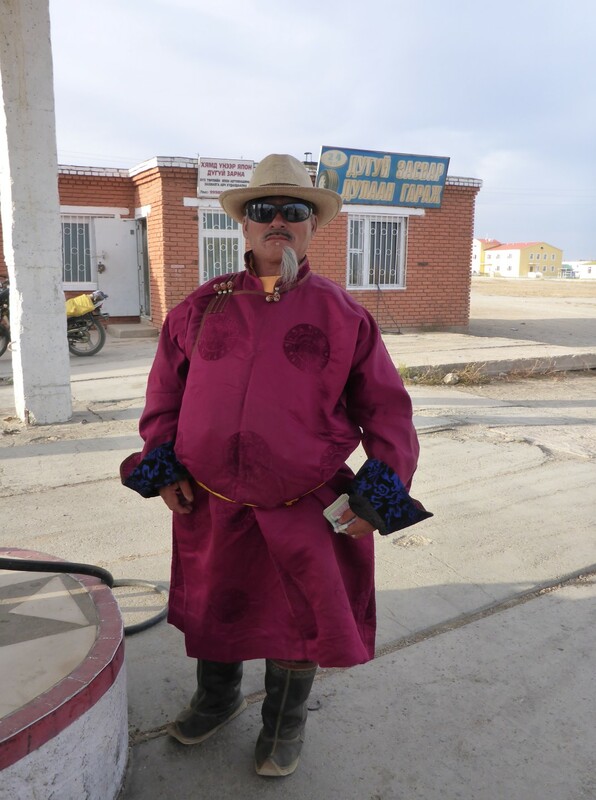 Their driver was also there along with a few other Mongolians. We enjoyed a nice chat and one of the women asked me how old I was, mainly because I was reading things without having to put glasses on. I explained to her that I’d had my eyes fixed a few years previously. They were surprised to hear how long I’d been away on my own, a similar reaction to that which I’d had from others on my journey. Once again it was very nice to be chatting with ordinary Mongolian people. I had one more place to take a trip out to, the Flaming Cliffs. I never did find them. Their location isn’t as easy to pin down as Vulture Gorge was but I tried to find the right road out of the town and failed. By the time I’d tried all the roads my GPS suggested might do the trick I’d got a bit fed up with it, so I went back to my hotel room to finish off my planning for my trip over the next few days. Perhaps I should have asked Zaya for advice the previous night but I didn’t think of it. Roadside monument to something. I just wish I knew what! One thing I knew I’d need would be extra fuel capacity. Fuel consumption across a journey like this tends to be something that’s very hard to predict. Having a relatively small engine, my bike is affected quite badly by head or side winds.It also doesn’t really like long, fast runs. I always get the best consumption when I’m on quiet back roads where even quite steep hill climbing doesn’t seem to have any adverse effect. It’s almost as if it revels in having to work a bit. I had a five litre can as spare but I knew that wouldn’t be enough. I was reluctant to buy another one because it would only get one use. People who’ve written about such trips tend to speak of getting two litre soft drinks bottles filled up with spare fuel and strapping them on to their bike. 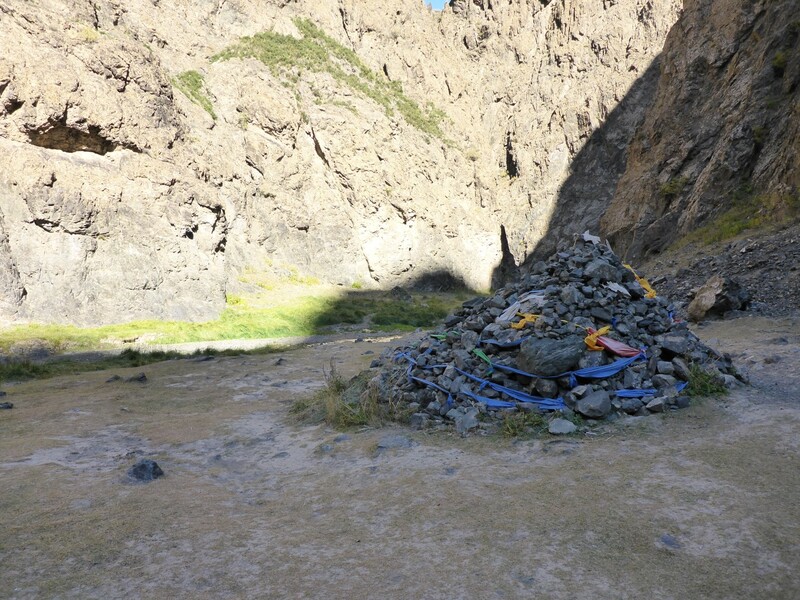 Mongolians are into recycling in a big way – perhaps there’s money in it – and my bike was parked near to an area where the hotel stored their empty plastic bottles. I had a look through them and found three 2 litre beer bottles, which, with their screw on caps, would do the job nicely. I put them to one side ready to take them with me when I went to fill up next day. Another part of the preparation complete. Experience had shown me that I’d use at least two litres of water for cooking and drinking so I’d bought enough bottles of water to see me through 2-3 nights in my tent, just to be on the safe side. I had my route all planned out, with some waypoints set into my GPS. 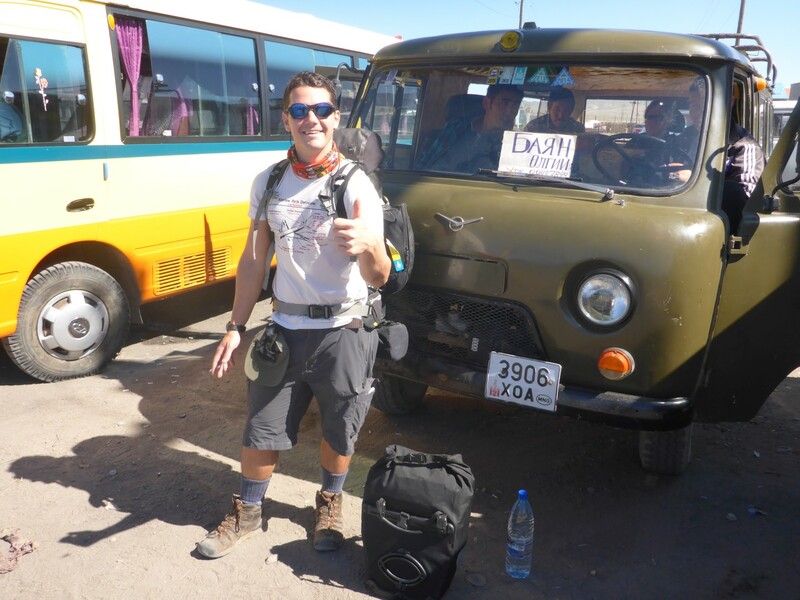 I was ready to go and looking forward to my mini adventure in the Gobi. Thanks Graham. Shiny side up? Wait until you see the next episode! Bloody brilliant! Again! I can see why you said you might never come home – life would be so incredibly tame here by comparison. Keep on keeping us up to date, please! Thanks David. At the moment I’d definitely prefer to be where I am than anywhere else.